When the Blue Jays signed J.A. Happ to a three year, $36 million deal in late November, the reaction from the fan base was mixed. Happ was a familiar face for Jays fans; they had seen him bounce in and out of the rotation over two-and-a-half mostly forgettable seasons. Both injuries and ineffectiveness kept him from locking down a starting job. Although, there were a few memorable moments in his Jays career. 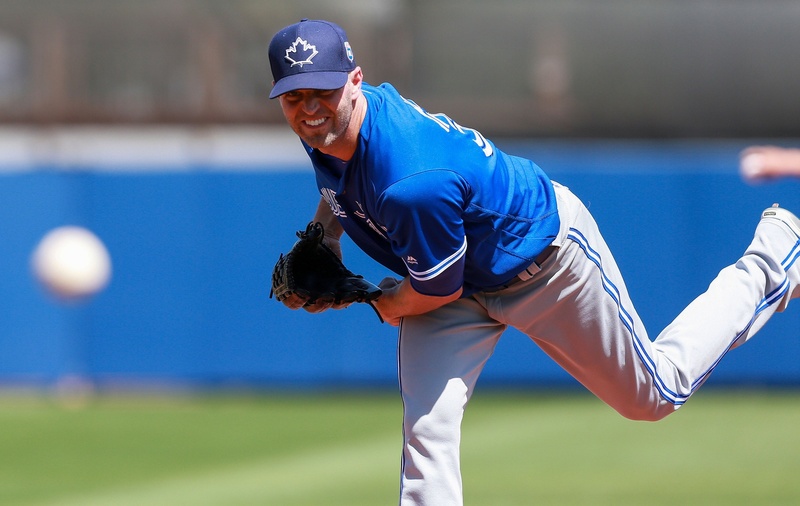 As one example, Happ made the Opening Day rotation in 2013 as a result of Ricky Romero’s sudden decline. That was certainly memorable. Whether it was bad luck or his own inconsistency, Happ was never able to cement his place in the Jays’ rotation during his time with Toronto. This had been an established pattern throughout his career. 2015 was the first season in which he’d made more than 30 starts, and only the third time he’d appeared in more than 30 games. Once I sat down to write this piece, Chen was the first comp to spring to mind. They’re both left-handers with some experience pitching in the AL East, and a reputation for not pitching deep into games. Looking at their career numbers rather than 2015, Chen is also someone who has historically out-performed his FIP, while Happ has generally undershot it. As well, Chen has been reliable for the Orioles, while Happ has tormented organizations with potential. Chen also has the benefit of moving from the competitive American League East to the less competitive National League East, while Happ is transitioning back to the AL after his time in Pittsburgh. As for contracts, Chen signed a five-year deal with the Marlins worth $80 million dollars, which works out to an average annual value of $16 million per season. He will also cost the Marlins their second-round pick, as he declined a qualifying offer from the Baltimore Orioles. However, Chen is also a few years younger than Happ, which likely factored in to his getting a longer deal. In a vacuum, Wei-Yin Chen is the better pitcher, and his going to a more favorable situation can’t hurt. With that said, his contract also gives him much more leverage with the opt-out after two seasons and the vesting option after six. The Jays, who would have had to give up their first rounder, were probably not seriously considering Chen at that price. Despite his being effective against the Jays during the season, there were few free-agent pitchers that made Jays fans less excited than Gallardo. Though the baseball card stats (13-11, 3.42 ERA over 33 starts) look fine at first glance, there were several other things that hampered Gallardo’s value prior to his signing a contract with the Orioles. For one thing, his strikeout rate has cratered over the last several years, finishing 2015 at an ugly 5.9 K/9. For another, even though he made 33 starts, Gallardo didn’t throw many innings, averaging out at less than six per start. The last time Gallardo threw more than six innings in a start was June 27th, and that start was the only time all year he threw more than seven. Gallardo’s 2015 was his seventh full season in the Major Leagues, having notched 1473 innings in his career.One wonders if the miles on his arm are contributing to the waning strikeout rates and stamina. The money (and initially failed physical) bore that out as Gallardo signed a two-year deal with the Orioles for $22 million, with a club option that could bring the total value of the deal up to $35 million. He did also cost the Orioles their first round selection, which would have been the 14th overall pick. They do get a compensation pick back with Chen signing with the Marlins, but it still ends up as a slight loss for them as they got a pitcher who’s probably going to be worse than Chen this year. In the end, from only the stats, the balance of Gallardo’s career so far is certainly better than Happ’s. However, the declining innings and strikeouts from Gallardo, combined with his costing the Orioles a first round pick makes the Happ deal look like a better call. Does Gallardo’s contract being shorter make it better? Maybe, but teams generally shouldn’t throw away a first round pick for two years of a clearly declining starter. The 2015 statistics are different, but we clearly see two pitchers who’ve had similar career paths. Estrada, like Happ, has been inconsistent, previously bouncing in and out of the rotation with the Brewers. This seemed like it was going to continue in Toronto, as Estrada started the season in the bullpen, but he soon made his way into the rotation. Once that happened, the rest was history. He established himself as one of the Blue Jays’ best pitchers, posting career bests in starts, innings pitched, and strikeouts; leading to a 10th place finish in Cy Young voting. After that season, Estrada, like the others on this list, had the dreaded qualifying offer hanging over his head, which hampered his value. Despite having a better year, he signed for similar money to Happ. If we look solely at the 2015 stats, it appears that the Jays got a bargain with Estrada. However, as is the case with the other players we’ve looked at, trends and the body of work are important. In comparison to others in this piece, Estrada simply didn’t have the track record of success before coming to the Blue Jays. They acquired him for Adam Lind in the 2014-15 offseason; a player the Brewers “liked” so much that they moved him to the Mariners prior to this season. While the qualifying offer didn’t severely hamper the market for Chen and Gallardo, it did for Estrada. Though, that also could have been a few troubling trends. Estrada’s FIP was the second-highest he’d had in a full season in the big leagues, and despite a career low ERA, his strikeout rate was the lowest of his career. Estrada thrived on a fantastic change-up, and it will be interesting to see if an off-season of preparation can help the league adjust to him. Nevertheless, Estrada and Happ provide similar value for the Blue Jays in 2016, with Estrada probably being a little bit better. This offseason, Ian Kennedy got five years and $70 million dollars from the Royals. This came after a season wherein he lost 15 games and had a 4.26 ERA. Oh…and and he’ll cost the Royals their first round pick. That’s not a joke. That actually happened. Of course, the Royals are coming off of two World Series appearances…so it’s hard to criticize that front office too much. Maybe it’s mechanical: Edinson Volquez had his best year with the Royals, spotting 96 mph fastballs on the corner against the Jays during the postseason. If they fixed Volquez, maybe they think they can fix Kennedy. Kennedy was successful as recently as 2014, when he notched 13 wins, 201 innings, and a nice enough 3.63 ERA. He hasn’t always been bad. He’s also made 30 starts for six consecutive years, which is something to note in an age of increased pitcher injuries. As well, he did post a 9.3 K/9, which is a nice number from a starter. However, he’ll probably never reach the heights of his 2011 season in Arizona, when he finished 21-4 with a 2.88 ERA, as he’s moving into the American League. The formerly touted Yankees prospect is more of a durable journeyman at this point. Although, given the construction of their team…maybe that’s what the Royals were looking for? They have built fantastic bullpens, year after year, and maybe all they wanted was a pitcher who can go six innings and pass the ball off. As the Royals’ pick is somewhere in the 20s, a lost first rounder probably didn’t trouble them as much. Even then it’s still one less draft pick, spent on a pitcher who’s had one good season in the last three. Ultimately, this one’s the easiest to argue for the Jays, as Kennedy’s almost certainly a worse pitcher than Happ, save for that durability. This is a hilariously unfair comparison for several reasons. David Price, by any measurement, is much, much better than J.A. Happ, and got way more money. The Red Sox didn’t even need to give up a draft pick to get him, as Price was acquired by the Blue Jays in a mid-season trade. One might use Happ’s stretch with the Pirates as a comparison, but playing the arbitrary endpoints game at the trade deadline is disingenuous at best. Taking the best stretch of Happ’s career and comparing it to an elite level starter’s usual output is a shaky attempt to justify the cavernous drop off from Price to Happ. The reason Price is on this list is solely because he was the one whom Jays fans compared Happ to when he was signed. After spending prospects to get Price at the deadline, and watching him dominate down the stretch, fans (and I count myself in this group) harbored dreams of him staying with the Jays after his contract expired. Price certainly said all the right things about wanting to stay, but given how much he was going to cost, it was unlikely that he was going to return. There were other holes for the Jays to fill, and future problems to consider. Estrada was a free agent, Mark Buehrle’s reliable 200 innings departed, and they had a club option on knuckleballer R.A. Dickey, leaving up to four potential vacancies in Toronto’s rotation. With an arbitration raise coming to MVP Josh Donaldson, and Jose Bautista and Edwin Encarnacion’s respective free agencies looming after this season, committing $30 million+ per season to David Price just didn’t make a lot of sense. There are times when spending for high-end talent is the right call, but for the Jays, already stocked with a lot of great players, spreading the wealth around was much more pragmatic. In the clear light of day, and with real baseball that counts just around the corner, we can look back and see that the J.A. Happ contract was fine…perhaps even good with how the pitching market developed. Seeing that potentially lesser pitchers signed for more money and cost draft picks, the Jays moving quickly on Happ looks much better. However, coming down from the high of David Price, it’s easy to see how Happ would have seemed disappointing earlier on in the offseason. It didn’t help that Happ had a prior history with the Jays; a history that some fans remember all too well (for the wrong reasons). J.A. Happ isn’t exciting. He’s not an ace. He’s not someone you can reliably pencil in for 200 innings. He’s not someone who’s going to contend for the Cy Young every year. J.A. Happ is a multi-grain bagel with butter for breakfast: it’s okay, it gets the job done, but it’s not much fun, and you’re not really looking forward to it. David Price was the cinnamon roll with sugary frosting: delicious, enjoyable, and something you want to have again, even if it isn’t a great long-term decision for your health. If there’s something we’ve all learned growing up, it’s that taking the bagel is probably the smarter move. Dave is a resident of Calgary, Alberta, and a lifelong fan of the Blue Jays and baseball, having lived near Toronto around the LAST time it was hard to get tickets to Jays games. All this proves is that Happ only looks good when you isolate his 2015 season.